Detail : George's second solo single. The song was written and recorded as a prelude to the concert which took place on August 1st 1971 with (oddly ?) an afternoon and evening performance. 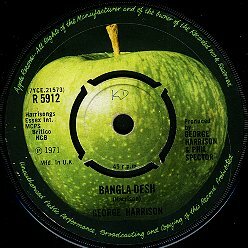 The B-side appears on no other release by George, and was written after his mother died of cancer during the recording of "All Things Must Pass" on 7th July 1970. No picture sleeve and a standard Apple label.